Browse our range of holiday villas in Costa Teguise. The resort is located on Lanzarote's south east coastline around fifteen minutes from Arrecife airport. And is located in close proximity to most of the islands key visitor attractions. Such as the Jameos del Agua, Jardin del Cactus and the Green Caves. 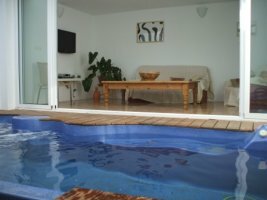 Whilst also boasting an excellent range of holiday accommodation and Lanzarote villas for rent. Costa Teguise is home to some excellent beaches - such as Playa Cucharas which is the main beach in the centre of the resort. And we offer a large selection of villas in Costa Teguise for rent - in popular areas such as Playa Bastian. Making our selection of Costa Teguise villas ideal for anyone seeking a relaxing beach based break. Our range of Costa Teguise holiday villas all boast private pools and modern amenities. Offering good quality rental accommodation at reasonable prices. So browse our selection of villas in Costa Teguise below and book your holiday in Lanzarote direct online. 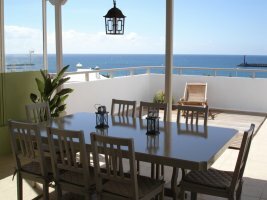 Ocean View Penthouse is a beautifully furnished and spacious apartment overlooking Las Cucharas beach in the heart of Costa Teguise. Detached villa with private pool in a tranquil part of Costa Teguise. Three bedrooms, two bathrooms, sleeps up to six people. The Beach House boasts its own pool and an amazing location just 100 metres from Playa Cucharas.